Have you tried any of the scents from the Dior La Collection Privée? They are exclusive fragrances for men and women created for the house of Dior by it’s perfume creator, Francois Demarchy. I do love the French penchant for drama… a fragrance that is ‘noble’… ‘ a flower that is at the heart’… it does make them sound most appealing… They are very lovely and so far I have sampled Cologne Royale…a gorgeous scent for the men… in the feel of Eau Sauvage… with a hint of Sicilian Lemon and Italian Neroli. 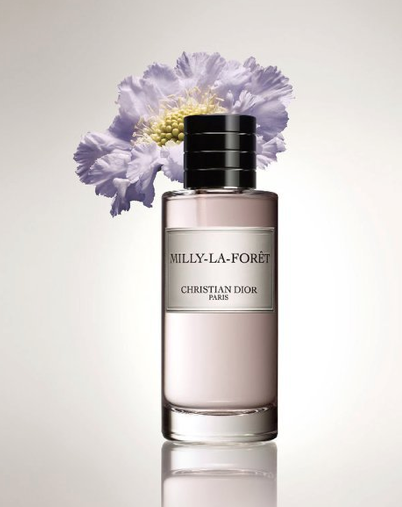 Milly La-Forêt , one I am seriously tempted by, is named after Dior’s country escape outside of Paris in Milly La Forêt. This scent is reminiscent of a romantic stroll through the forest… with notes of orange blossom, jasmine and iris. But… New Look 1947 might be the one for me…. 1947 was the year that Christian Dior held his first fashion show in Paris and it was there that Dior was hailed as ‘a new look’… This is a highly floral fragrance with Indian tuberose, Turkish rose and Jasmine… As a lover of tuberose… I think I this could just be me. There are ten perfumes in all… and the packaging is superb… The bottles are very simple and elegant with beautifully engraved black lids… the problem will be choosing only one fragrance… As I understand, La Collection Privée is only available in Paris and London… so if you are in Europe try some samples and at the same time make sure to ask for the little white illustrated booklet describing each of the scents. Have to try, love fine perfume and the packaging is so pretty and elegant. Thanks for the heads up. Years ago, I worked in New York City in the cosmetic industry. I used to keep a bottle of "Eau Sauvage" in the refrigerator during the hot summer months. It always felt so cool and refreshing and I loved the scent on my skin, even though it is supposed to be a male fragrance. Thanks for the memories! I'll look forward to trying the others. My Dior fave right now is J'Ador…love it! I'm so disappointed they are not available outside of London and Paris. New Look 1947 sounds amazing. I haven't been disappointed by a single bottle of Dior that I purchased! They just know how to put together great fragrances!! I will add this to my list. I fall for pretty bottles and beautiful fragrances every time! This looks lovely and I'll look forward to trying it. I am a Licensed Clinical Aesthetician which means my vanity is like a chemistry lab and missing girly fluff. Sometimes I just have to defer and go for the sweet goodies! If you have a sec, check out my post on VANITY. Enjoy your Friday and have a nice weekend. Always an adventure when discovering a new scent sounds so yummy! I love home fragrances…I'm currently hooked on Jo Malone's Grapefruit but I will definitely try these at some point. You always give us such good tips on these kind of things. They sound exquisite. I'd love to get my hands on one of those little illustrated booklets… I wonder if they'll decide to release the range here in Australia. I hope so. Have a beautiful weekend, dear Vicki. Oh my. Those two Dior fragrances (both of them) were exactly the ones on my list to try. I love Dior! I think you may be right….will pop into Dior next week to try them. Merci beaucoup.